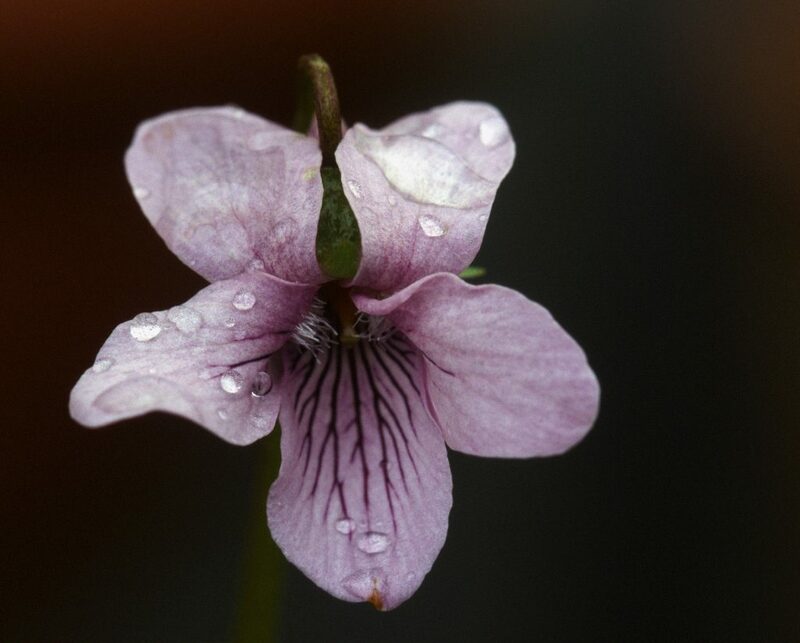 Viola palustris has been a confusing puzzle in North America for most of the last century, though not drawing much attention because most of its distribution is in relatively remote areas and occurrences are uncommon. Three races occur in North America; in the northeast, the Rocky mountains and the northwest. The first specimen of V. palustris, collected in Europe, was described by Linnaeus in 1753. The race that occurs in the northeast of North America is the ‘Linnaean’ palustris var. palustris that has spread from Europe through the Faeroe Islands, Iceland and Greenland. 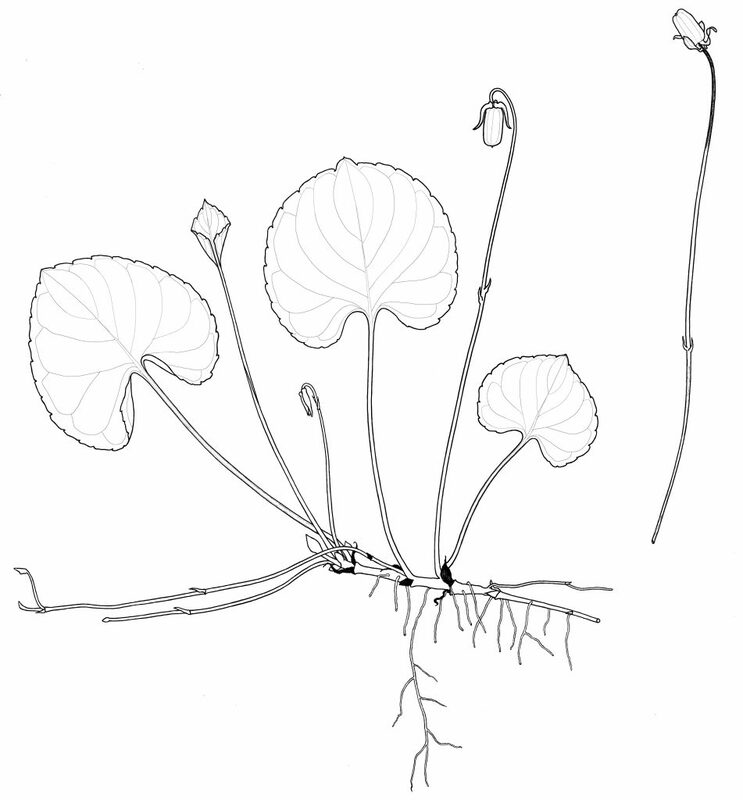 In 1934, studies by Bold and Gershoy observed slight differences between the northwest North American Viola ‘palustris’ compared with the Linnaean palustris e.g. in shape of leaves and color of seeds. In 1968, Sorsa’s cytological studies of the northwestern NAmerican ‘palustris’ plants led him to suspect that they were of hybrid origin. He wrote that the western plants ‘are less typical and often showing variation in character combinations’ but he did not go as far as taxonomically separating this western North American population as a distinct species. Though the plants resembled characteristics of the European epipsila type (chromosome number 24) they had a chromosome number of 2n=48. Sorsa concluded that the northwestern race probably originated in northeastern Asia through hybridization of two diploid types, one of which was the epipsila type. This hybrid expanded its range into more oceanic environments, while the slightly different diploid Viola epipsila, as subspecies repens, extended from Siberia through the Beringean area as far as Alaska and Western Canada. 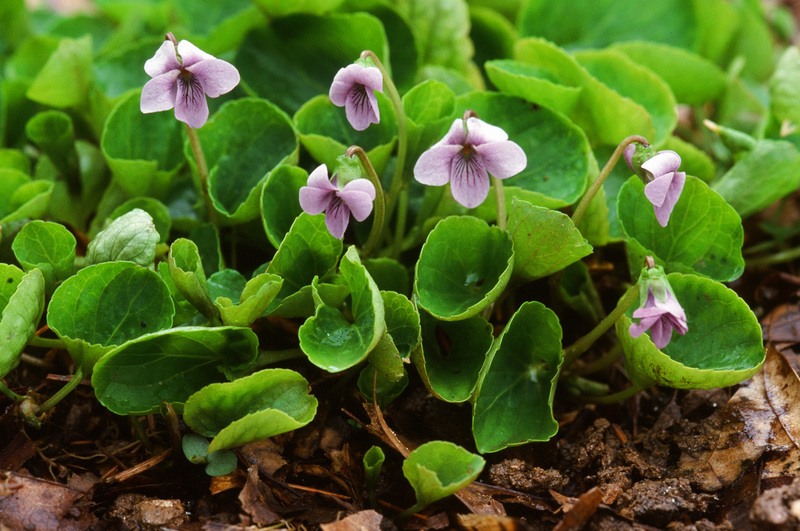 The third race, Viola palustris var. brevipes, is distributed throughout the Rocky Mountains from Colorado to Canada. This race has an unstable chromosome count, with varying numbers from different locations. Confirming Sorsa’s prediction, Marcussen (2010) has shown that the northwest and the northeast populations, both 2n=48, differ in their genetic origin. Though they are very close, they have different allopolyploid origins. 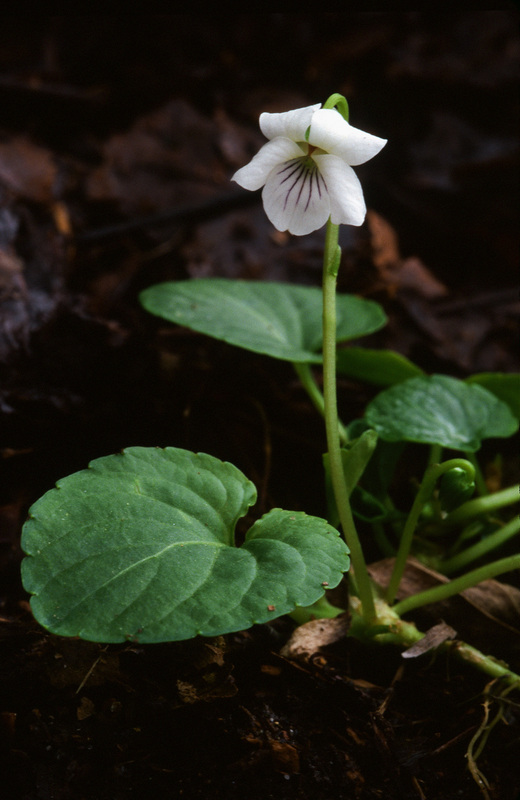 The northwestern Viola ‘palustris’ has one genome from the V. macloskeyi/occidentalis complex and a second from V. epipsila ssp. 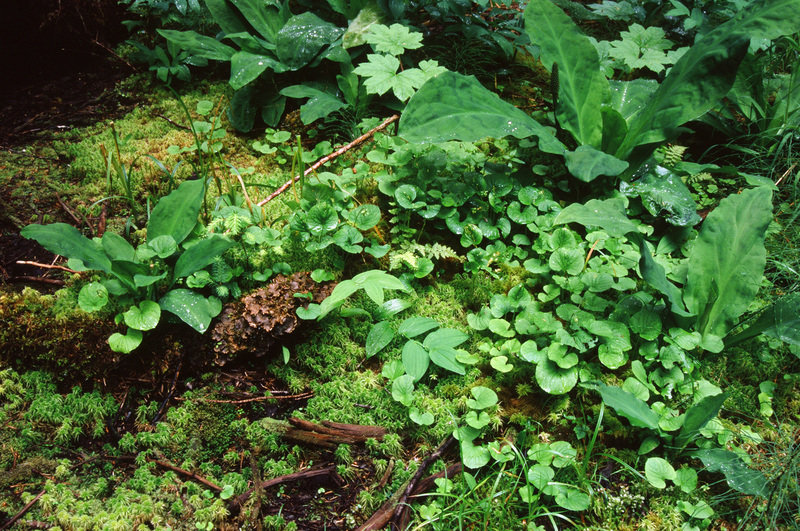 repens, all of which parent species are from western North America or Asia. The European V. palustris is likewise of hybrid origin though from different diploid parents: V. epipsila ssp. epipsila and V. pallens, the latter being the maternal parent. In the case of the eastern North American population of Viola palustris, the genome donors do not occur together today but grow on either side of the Atlantic, V. pallens in North America and V. epipsila ssp. epipsila in Europe. Since V. macloskeyi and V. pallens are now shown to be different species, the same applies to the two races of V. palustris. The type specimen of V. palustris is European, which means that a new name will have to be applied to the western American population, until which time it should be referred to as V. sp.nov. 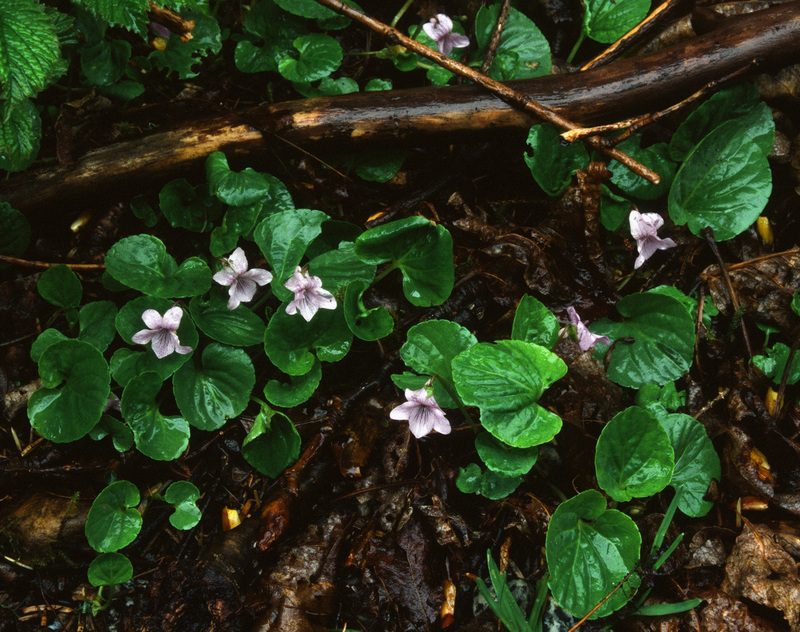 Confusingly, what had been believed to be tetraploid races are now thought to be octoploid (2n=8x=48), multiples of the basic x=6 for Palustres violets, in other words the northwest and northeast populations have eight sets of chromosomes, while the central NAmerican race, Viola palustris var. brevipes, has been shown to have a variable chromosome number as it evolves and adapts to different environments. 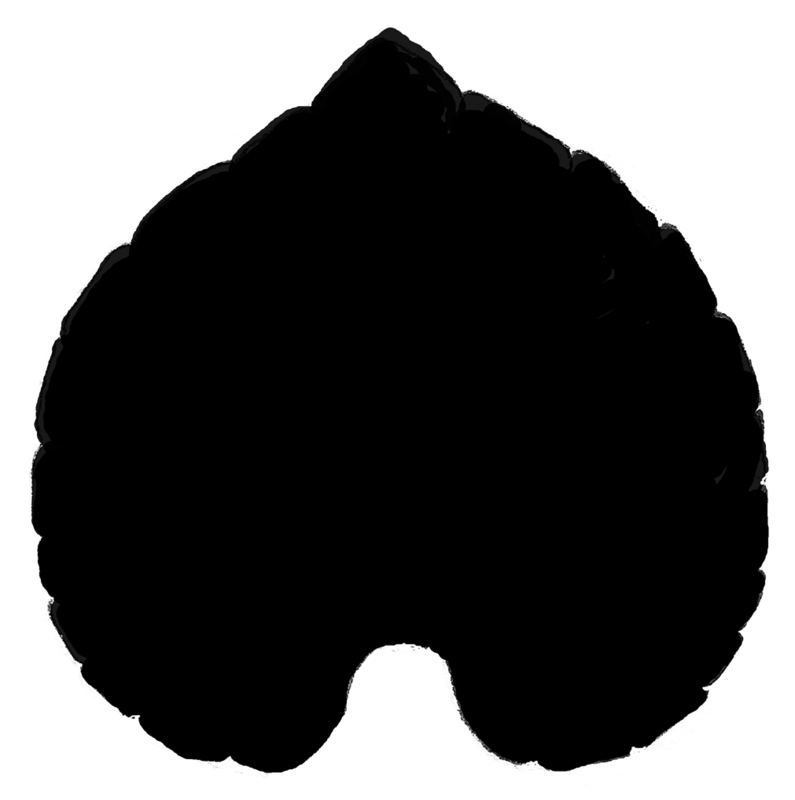 This is discussed under the full description of V. palustris var. brevipes. 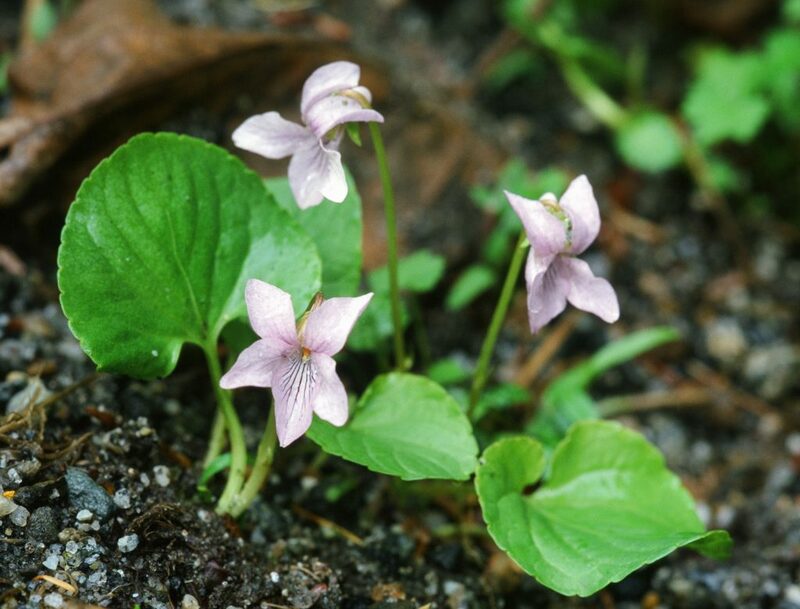 Viola palustris seems to consist of an evolutionary active complex, able to balance itself in different environments by forming various types due to selection and genetic drift. All observations and measurements herein are from my own personally collected material. Previously published floras of the states where these species occur contain information that is usually a mixture from the three species so is not always reliable. British Columbia is the only area where V. epispila subsp. repens, northwestern ‘V. sp. nov., V. macloskeyi and V. renifolia occur together. As most of these species are able to cross when growing together, it can be difficult to identify the separate species. Uncommon to rare. Branching runners produce large pink-mauve flowers above round to ovate leaves. It occurs in coastal areas, in part or full shade, in very wet, swampy, shrubby places; a wetter habitat than that of the European V. palustris var. palustris. North of Juneau it was growing in an open sandy roadside ditch at the edge of a forest. Note that in this location, rainfall is very high and ‘sunny’ is misleading as there are only 17-19 days of sunshine from July to November. Plants east of Issaquah, Washinton were growing in a very wet bog in moss and composting leaves in the shade of, and amongst, the roots of shrubs, again with high Seattle rainfall. This violet flowers about a month earlier than V. langsdorffii, from late April-early May at lower coastal altitudes, usually below 150 m, but later in marshes at higher elevations in the west Columbia River Gorge. Alaska to British Columbia, Washington, Oregon, to n. California. 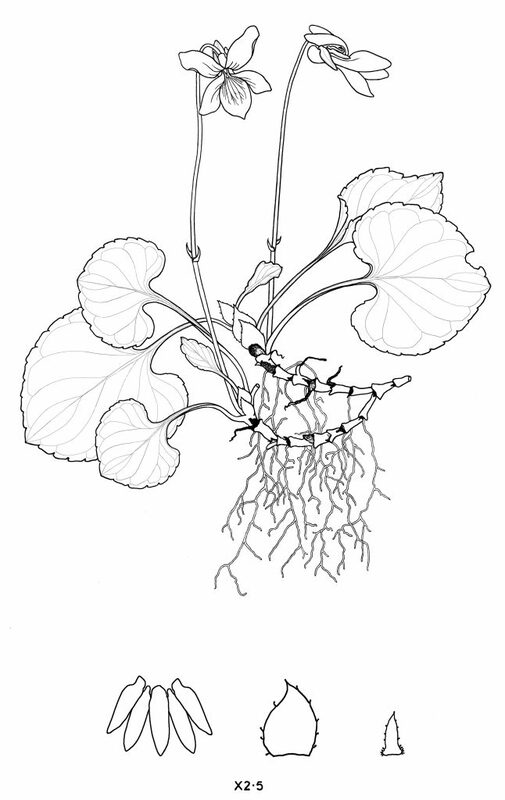 Stemless perennial, 5–22 cm high, glabrous, from horizontal branching, creeping rhizomes which can be elongated between leaf bases; forming late-season stolons. Leaves 2-3 at growing tip of rhizome, leaf margins; petiole winged at the top,2.0–17.0 cm; leaf blade 4.0-6.5 cm, ovate to round, crenate, base cordate, tip slightly pointed, margin crenate, crenae relatively long; stipules green to pale red, ovate, 0.7 cm long; peduncle very stout, 10-12 cm, with bracts slightly above the middle, though they can be lower on older cleistogenes, bracts 0.15-0.3 cm long. Sepal plus appendage 0.5 cm, appendages thick, 0.1-0.2 cm. One flower arising from the tip of each branch of horizontal rhizome; flower large, more open with space between the petals than Linnaean V. palustris, pink-mauve, 2.0 x 1.8 cm; tip of lowest petal to end of spur 1.7 cm; petals acute to rounded at apex, upper two petals sometimes twisted, narrow, lateral petals with few to many straight to slightly clavate hairs, lowest petal longer than laterals with purple guidelines, petal spur 2-3 x as long as sepal appendages, end rounded, saccate, 3.5 mm long x 3.5 mm diam. Ovary and style green, 0.45 mm high; seed pod green, 6–7 mm; seeds grey very small colourless elaiosome, 1.6 x 0.9 mm. Faint honey perfume. 2n=8x=48. Next Post Viola palustris L.